Gold Tropical Fish Spiral Macrame Bracelet, adjustable cord bracelet Soft Brown Bracelet. Black Bracelets, Adjustable Bracelet, Protection Bracelet, Silver Angel Wing, Infinity, Hamsa Hand, Lotus Flower, Yoga lover gifts. 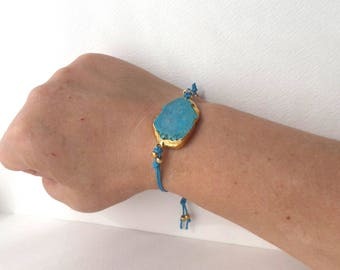 Turquoise Slice Bracelet, December Birthstone, Gold Edged Slab Bracelet, Turquoise Cotton Cord, Sliding Knot, Adjustable Cord Bracelet. Sand Dollar Bracelet, Beaded Macrame Bracelet, Adjustable Bracelet, Blue or Neutral Casual, Beach, 2 Unique Designs, BFF Gifts. Labradorite Macramé Bracelet, Stone, Grey Macrame, adjustable bracelet, Antique Gold Setting, gift gor her, BFF gift.